Local infection with necrotizing pathogens induces whole plant immunity to secondary challenge. Pathogenesis-related genes are induced in parallel with this systemic acquired resistance response and thought to be co-regulated. The hypothesis of co-regulation has been challenged by induction of Arabidopsis PR-1 but not systemic acquired resistance in npr1 mutant plants responding to Pseudomonas syringae carrying the avirulence gene avrRpt2. However, experiments with ndr1 mutant plants have revealed major differences between avirulence genes. The ndr1-1 mutation prevents hypersensitive cell death, systemic acquired resistance and PR-1 induction elicited by bacteria carrying avrRpt2. This mutation does not prevent these responses to bacteria carrying avrB. Systemic acquired resistance, PR-1 induction and PR-5 induction were assessed in comparisons of npr1-2 and ndr1-1 mutant plants, double mutant plants, and wild-type plants. Systemic acquired resistance was displayed by all four plant lines in response to Pseudomonas syringae bacteria carrying avrB. PR-1 induction was partially impaired by either single mutation in response to either bacterial strain, but only fully impaired in the double mutant in response to avrRpt2. PR-5 induction was not fully impaired in any of the mutants in response to either avirulence gene. Two pathways act additively, rather than in an obligatorily synergistic fashion, to induce systemic acquired resistance, PR-1 and PR-5. One of these pathways is NPR1-independent and depends on signals associated with hypersensitive cell death. The other pathway is dependent on salicylic acid accumulation and acts through NPR1. At least two other pathways also contribute additively to PR-5 induction. In response to local infection with necrotizing pathogen, plants display a whole plant enhanced immunity to secondary challenge (systemic acquired resistance or SAR) . A characteristic set of genes termed pathogenesis-related (PR) is induced both locally and in distal tissues in parallel with SAR induction . Accumulation of salicylic acid (SA) has been shown to be necessary for induction of SAR . 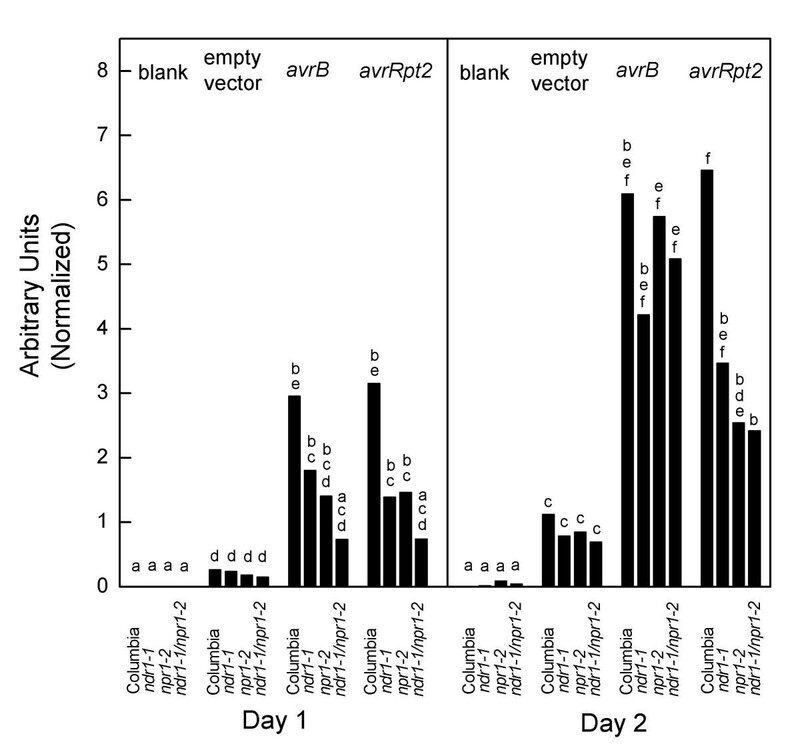 The Arabidopsis ndr1-1 mutant showed drastically impaired induction of SAR and PR-1 gene expression in response to infection with Pseudomonas syringae bacteria carrying the avirulence (avr) gene avrRpt2. This mutant is also incapable of showing a hypersensitive response (HR) to these bacteria [5, 6] except at very high levels of inoculum . The HR is a macroscopic leaf collapse. The HR occurs in response to infection with avirulent bacteria at levels of inoculum that cause a large percentage of leaf cells to undergo programmed cell death (PCD) . In contrast to results with avrRpt2, P. syringae bacteria carrying the avirulence genes avrB, avrRpm1, avrPphB or avrRps4 elicit an exaggerated HR relative to that on the wild-type Columbia parent [5, 7]. In a study in which bacteria carrying avrB were chosen as a representative member of this class, in further contrast to results with avrRpt2, these bacteria were capable of eliciting SAR and PR-1 induction on ndr1-1 mutant plants . However, induction of SA accumulation by ndr1-1 mutant plants was impaired at early time points to a similar extent in response to bacteria carrying either avr gene . These results suggested that at least two pathways control SAR and PR-1 gene expression. One pathway is directly dependent on SA accumulation. The second pathway is not directly dependent on SA levels. The correlation between ability to elicit the HR and to elicit SAR and PR-1 induction led to the model that the second pathway was caused by signals associated with hypersensitive cell death. 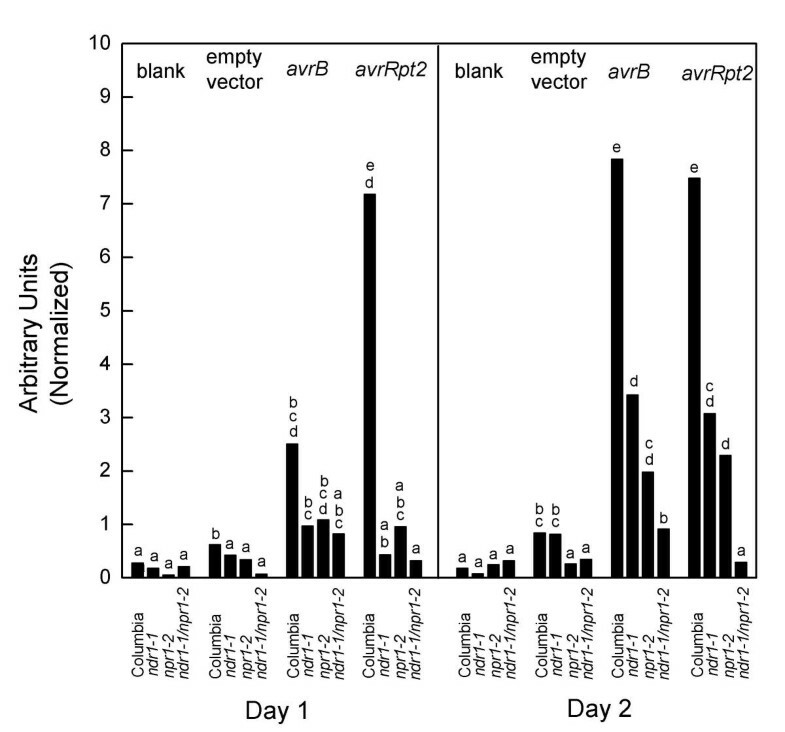 Despite the severe impairment in SA accumulation within the first 12 hours post-inoculation of ndr1 plants, bacteria carrying avrB could nonetheless induce PR gene expression and SAR because of the HR-associated pathway. Bacteria carrying avrRpt2 could not because both pathways were impaired by the ndr1 mutation. This study could not address the question as to whether the HR-associated pathway alone was sufficient to induce SAR and PR-1 because SA accumulation did occur late in the response. Induction of SAR has been reported to be dependent upon the NPR1 gene [9–11]. In these studies, neither SA/SA analogs nor avirulent bacteria were able to induce SAR on npr1 mutant plants. The biological inducer of SAR tested in these experiments was P. syringae bacteria carrying avrRpt2. In contrast to ndr1 plants, npr1 plants do show the HR in response to P. syringae carrying avrRpt2 (data not shown). These results could be taken to suggest that the HR-associated pathway is not sufficient to induce SAR in the absence of the NPR1-dependent, SA-associated pathway (but see below for why this conclusion is not correct). In contrast to SAR induction, induction of PR-1 by avirulent bacteria has been shown to occur in npr1 mutants . It is, however, reduced in extent and delayed. If npr1 mutants are indeed fully blocked in SAR induction, then the pathways leading to PR-1 induction can not be the same as those leading to SAR. However, we have argued on the basis of results with ndr1 mutant plants that HR "triggering" in response to the avrRpt2/RPS2 combination is weaker than that in response to avrB/RPM1. Weaker "triggering" results in a lower probability of individual cells undergoing PCD early in the HR, prior to the onset of potentiation caused by increased SA levels [4, 12]. Signaling elicited by avrRpt2 clearly differs in many respects from that directed by the other avr genes. Use of bacteria carrying avrB to elicit SAR would allow a more rigorous test of whether the NPR1-dependent pathway is essential for SAR induction. To clarify the signaling circuitry governing SAR and PR gene induction, we have constructed a ndr1/npr1 double mutant. This line was compared with wild-type Columbia Arabidopsis and both single mutant lines for the ability to display biological induction of SAR and PR gene expression. We conclude that SAR, PR-1 induction and PR-5 induction are regulated in parallel by the two pathways we have previously delineated , but the effects of these pathways are additive rather than obligatorily synergistic. Moreover, additional pathways also contribute additively to PR-5 induction. If NPR1 is truly essential for SAR , npr1 mutant plants should not be able to undergo SAR in response to P. syringae pv. tomato DC3000 (hereafter DC3000) carrying avrB. Alternatively, if HR-associated signals leading to SAR act independently of NPR1, DC3000•avrB might be able to elicit SAR on npr1 plants. The results of this experiment are presented in Figure 1. Columbia, wild type plants showed a three order of magnitude reduction in growth of virulent bacteria in plants that had received a prior inoculation with DC3000•avrB. SAR was also displayed by ndr1-1 mutant plants. These results are comparable to those published previously . Clear SAR was also displayed by the npr1-2 mutant. The SAR response was statistically significant (Student's t test, P < 0.05) for all three lines in this experiment and in a replicate experiment. This assay is not sufficiently sensitive to quantitate small differences in SAR between the lines. However, it is clear that all three lines did display SAR. As it is likely that both mutant lines are null alleles (previously established for ndr1-1 and argued below for npr1-2), the hypothesis that NPR1 is essential for SAR is thus rejected. DC3000• avrB elicits systemic acquired resistance on the ndr1-1/npr1-2 double mutant and both single mutants Plants were either inoculated with 2 × 107 bacteria mL-1 DC3000•avrB (white bars) or not inoculated (black bars). Two days later, inoculated leaves were excised. Remaining leaves were pressure infiltrated using a syringe with 5 × 104 bacteria mL-1 DC3000•empty vector. Data points represent means of triplicate (Day 0) or quintuplicate (Day 2 or 4) determinations of in planta bacterial growth. To test epistasis relationships between these mutants, a double mutant was constructed (see Methods). The double mutant was also tested for SAR in response to DC3000•avrB (Figure 1). Statistically significant SAR was seen at the two day time point but not at the four day time point (Student's t test, P < 0.05). In a replicate experiment, SAR was statistically significant only at the four day time point. The combination of the two mutations was thus sufficient to abolish most of the SAR response. Residual SAR may have been due to HR-associated signals in that the double mutant did display a HR to DC3000•avrB. The macroscopic HR phenotype was exaggerated, like that of the ndr1-1 single mutant (data not shown). We have previously argued that PR-1 gene expression is controlled by two separate pathways . One pathway results from SA accumulation and is dependent upon the NPR1 gene product. The second pathway results from signals correlated with the HR and is NPR1-independent. The ndr1-1/npr1-2 double mutant was used to further test this hypothesis. The double mutant, each single mutant and Columbia wild-type plants were infected with 1 × 106 bacteria mL-1. At this level of inoculum, most leaf cells did not undergo PCD (data not shown). Macroscopic tissue collapse was therefore not seen, allowing PR-1 gene expression to be quantitated using Northern blots. The data is presented in Figure 2. Columbia wild-type Arabidopsis showed high levels of PR-1 induction in response to either DC3000•avrB or DC3000•avrRpt2. The level of PR-1 induction shown by either single mutant line in response to either bacterial strain was greatly reduced relative to that shown by Columbia. However, both single mutants still showed PR-1 induction at the two day time point in response to either bacterial strain. The level of PR-1 induction shown by the double mutant in response to DC3000•avrRpt2 was not significantly different from that shown in response to either DC3000•empty vector or the MgCl2 blank (Student's t test, P > 0.05). In this experiment, when there was no PCD and NPR1 activity was blocked by mutation, no induction of PR-1 resulted. By contrast, DC3000•avrB did elicit highly significant PR-1 induction (Student's t test, P < 0.01 for comparison to DC3000•empty vector or blank). As NPR1 activity was blocked by mutation, PCD-associated signals likely explain the residual PR-1 induction. These results confirm the original model that the two pathways for PR-1 induction are additive. Induction of PR-1 gene expression Plants of the indicated genotype were inoculated with 1 × 106 bacteria mL-1 DC3000 carrying the specified avirulence gene or the empty vector or a 10 mM MgCl2 blank. At the indicated time points, leaf samples were taken for total RNA preparation. Probes derived from the PR-1 cDNA were used for Northern blots. Quantitation was with a phosphorimager. All blots were stripped and probed again with a radiolabeled probe made from the ROC1 cDNA as a control for RNA loading. These values were used for data normalization. Each bar represents a mean of data from 3 separate experiments. Differences between means were assessed for statistical significance using Student's t tests. Lowercase letters indicate statistically significant differences between means (P < 0.05 or in many cases greater significance). Comparisons of means were made separately for the two time points. The two postulated pathways acting in an additive fashion sufficed to explain bacterial induction of SAR and PR-1 gene expression. Experiments were next undertaken to extend the model to the control of PR-5 induction. DC3000•avrRpt2 or DC3000•avrB were inoculated into ndr1-1/npr1-2 double mutant plants, the single mutants, or the Columbia wild type plants. PR-5 gene expression was quantitated by Northern blots. The data is presented in Figure 3. At the one day time point, the double mutant showed significant impairment in PR-5 induction relative to wild type in response to either avirulent bacterial strain (Student's t test, P < 0.05). However, at the two day time point, only the impairment in response to DC3000•avrRpt2 was statistically significant at this level. 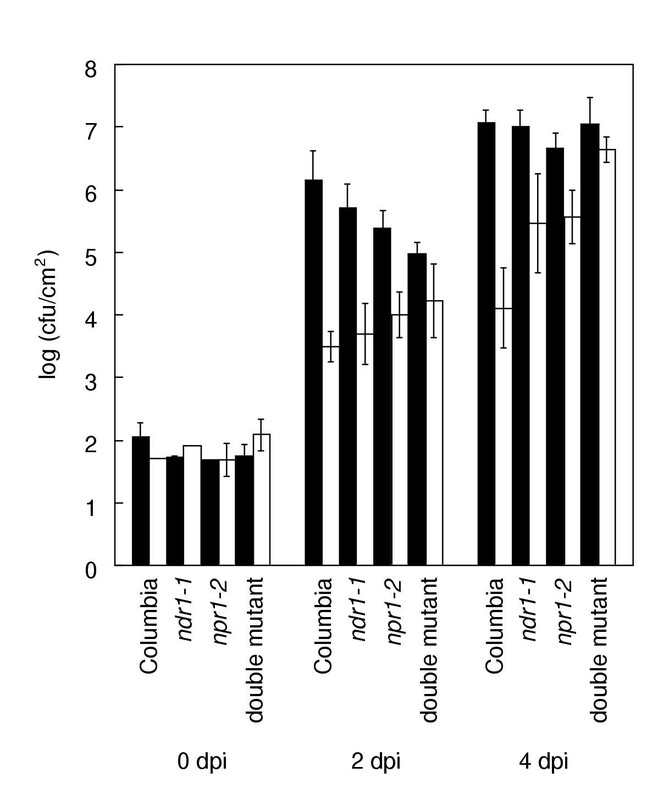 If the criteria for statistically significant differences was relaxed to P < 0.1, then the same qualitative picture was shown as with PR-1 in comparison of single mutants to wild type Columbia. Columbia plants showed differences at this level of significance from ndr1-1 or npr1-2 plants in induction of PR-5 in response to DC3000•avrRpt2 at both time points. These results are consistent with contributions to PR-5 induction coming from both the HR-associated pathway and the SA/NPR1-dependent pathway. However, PR-5 gene expression occurred in spite of blockade of both pathways in experiments with DC3000•avrRpt2 and the double mutant. This result was very different from what was seen with PR-1 induction or SAR. Clearly, the two pathways we have delineated do not constitute a complete picture of signaling leading to PR-5 gene expression. Induction of PR-5 gene expression Experimental procedures and data analysis were done the same way as with PR-1 gene expression experiments (Figure 2). PR genes are thought to be tightly associated with SAR because they are co-regulated with SAR [13, 14] and because many PR gene products have been shown to have antimicrobial activity . The complete impairment of npr1 plants in SAR induction  as contrasted with a partial impairment in PR-1 induction  in response to P. syringae carrying avrRpt2 challenged the hypothesis of co-regulation. However, avrRpt2 was shown to differ markedly from the other characterized P. syringae avr genes in the responses it elicited on ndr1 mutant plants [4, 5, 7]. The apparent challenge to the hypothesis of co-regulation could have been because of the choice of an atypical avr gene. Therefore, SAR and PR gene expression of npr1 mutant plants were assessed in response to a second avr gene (avrB). Markedly different results were obtained. Mutant npr1 plants were not fully impaired in induction of SAR, PR-1 gene expression or PR-5 gene expression in response to P. syringae carrying avrB. These results are consistent with the hypothesis of co-regulation. The apparent NPR1-dependence of SAR induction in response to bacteria carrying avrRpt2 is likely quantitative rather than qualitative. A potential alternative explanation for these results might be residual function of mutant gene products in the plant lines used. The ndr1-1 mutant is an unambiguous null mutant in that a deletion removes most of the coding region and the proximal promoter region . However, none of the characterized npr1 mutants have a large deletion [15, 16]. As such, attempts to define allelic series have relied upon the level of residual function associated with these mutants in assays of gene expression or fungal disease resistance [15, 16]. However, the complexity of signaling leading to these outputs complicates analyses of these phenotypes. A "null" mutant might still show gene expression or disease resistance caused by pathways that do not require the corresponding gene product. What is required is an assay where the output is due solely to an NPR1-dependent pathway. The experiment presented in Figure 2 provided such data. The combination of npr1-2 with ndr1-1 in a double mutant prevented the avrRpt2-elicited HR under the conditions used. Under these conditions, DC3000•avrRpt2 failed to elicit any PR-1 gene expression (the level was statistically indistinguishable from that seen with inoculation of a MgCl2 blank). Impairment of SA accumulation in the double mutant (Zhang, Gutsche and Shapiro, manuscript in preparation) resembled that in the ndr1 single mutant  at early time points prior to the onset of NPR1-dependent negative feedback on SA accumulation [10, 11]. Nonetheless, SA accumulation likely occurred by the time points taken in SAR and PR gene expression experiments reported herein. This assay depends solely on NPR1 function. The complete lack of PR-1 induction supports our contention that npr1-2 is indeed a null mutant or perhaps a severe hypomorph. This contention is further supported by published data showing that the npr1-2 allele failed to interact with putative target TGA transcription factor genes in a two-hybrid assay  or in an in vivo, reporter gene-based assay . The treatment of npr1-2 seedlings with exogenous SA failed to induce increases in PR-1 gene expression under some experimental conditions  albeit not under all conditions . The potential alternative explanation that results presented herein were caused by residual gene product function in the mutant lines used is thus not correct. The idea that SAR and PR gene expression are co-regulated has also been challenged by experiments with the eds5 and sid2 mutants . These mutants have been implicated in SA biosynthesis. They showed impairments in PR-1 induction in response to bacteria that were very similar to those displayed by ndr1 plants but marginal if any impairment in PR-2 or PR-5 induction. Direct comparison with results presented here required addressing an issue with the potential to affect interpretation of that study. In that study, PR gene expression was quantitated from uninfected parts of leaves that had been infected with 1 × 108 mL-1 DC3000•avrRpt2. This level of inoculum was sufficiently high to cause "false positive" spurious HR-like responses to DC3000•empty vector . Indeed, when sid2 mutant plants were inoculated with 2 × 107 mL-1 DC3000•avrRpt2, no HR was seen (data not shown). The high levels of inoculum used in the cited study can only be used without causing "false positive" HRs if a bacterial strain that is not a pathogen of Arabidopsis is used to deliver the avr gene product [5, 7]. When sid2 plants were inoculated with 1 × 108 mL-1 of a nonpathogen strain (P. syringae pv. glycinea Race 5) carrying avrRpt2, HRs were seen (data not shown). The identical results with the two bacterial strain backgrounds imply that the cited results with sid2 mutant plants were obtained under conditions in which high levels of bacterial inoculum overcame some effects of the mutation. The ndr1-1 mutation can also be overcome at high levels of inoculum. However, the level at which ndr1-1 phenotypes are overcome is higher than that for sid2 phenotypes in that 1 × 109 mL-1 of a nonpathogen strain carrying avrRpt2 is required to yield reproducible HRs on ndr1-1 plants . Clearly, the interpretation of results with PR-5 induction depends critically on the experimental design. The relatively unimpaired PR-2 and PR-5 induction in sid2 plants might imply that the HR-associated signals were quantitatively more important than the SA-associated signals. The same two pathways invoked to explain SAR and PR-1 induction could potentially account for PR-2 and PR-5 induction if this assumption were correct. The results presented herein, however, argue strongly that PR-5 induction is indeed regulated differently than SAR or PR-1 induction. The two pathways identified as making the major contributions to PR-1 and SAR induction were shown to contribute to PR-5 induction. However, significant PR-5 induction occurred in the double mutant in response to DC3000•avrRpt2 (Figure 3). DC3000•avrRpt2 elicited HRs on Columbia or npr1-2 plants but not on ndr1-1 plants or double mutant plants (data not shown). As such, these results can not be explained by HR-associated signals or SA-associated, NPR1-dependent signals. There must be additional pathways contributing to PR-5 induction. This conclusion is consistent with the original interpretation of PR gene expression data in eds5 and sid2 mutants that PR-1 and PR-5 are regulated differently . The data presented in Figures 2 and 3 suggest that there must be at least two additional pathways contributing to PR-5 induction. DC3000•empty vector did not elicit significant PR-1 induction on the double mutant at either time point (Student's t test, P > 0.05). However, the analogous experiment with PR-5 induction gave the opposite results. Moreover, at both time points, the PR-5 induction elicited by infection with DC3000•empty vector was to a similar extent regardless of allele status at the NDR1 or NPR1 loci (no statistically significant differences, Student's t test, P > 0.05). These bacteria elicited PR-5 gene expression in spite of the absence of a functional avr gene, the absence of PCD, and mutations in both the NPR1 and NDR1 genes. As even E. coli has been shown to induce plant defense-related gene expression , it should not be surprising that bacteria can elicit changes in plant gene expression via many different signaling pathways. Indeed, conserved features of bacteria can act as elicitors of gene expression through pathways distinct from those associated with gene-for-gene disease resistance . However, an additional pathway leading to PR-5 gene expression that stems from avrRpt2 function must also exist. DC3000•avrRpt2 elicited no statistically significant induction of PR-1 by the double mutant at either time point (Student's t test, P > 0.05). However, clear induction of PR-5 was seen in the analogous experiment. The level of PR-5 induction was higher than in response to DC3000•empty vector (Student's t test, P < 0.05). As the double mutant was susceptible to disease caused by this bacterial strain (data not shown), perhaps this residual gene induction was due to the virulence function of avrRpt2. Mutant npr1 plants have previously been shown to be impaired in induction of PR-1 but not PR-5 in response to virulent bacterial pathogen . These details are presented in a model of the signaling network for induction of SAR, PR-1 gene expression and PR-5 gene expression by avirulent P. syringae bacteria (Figure 4). We have used a representation scheme proposed recently for plant signal transduction networks that is based on Boolean formalisms used in engineering and computer science . Either of two "generators" shown can elicit signaling. One generator is infection of plants carrying a functional RPS2 allele with bacteria carrying avrRpt2. The second generator is infection of plants carrying a functional RPM1 allele with bacteria carrying avrB. An "or" gate is used to show that either way of eliciting signaling resulted in accumulation of SA. The NDR1 allele status was represented with a "switch". The ndr1-1 allele was pictured as analogous to an electrical switch where the contact is in an open position, impairing early SA accumulation. Boolean representation of signaling network The binary switches used to represent allele status at the NPR1 and NDR1 loci were rendered according to standard depictions in engineering texts. All other symbols are according to Genoud, Trevino Santa Cruz and Métraux . Signal generators were rendered as rectangles with black boxes inside them set at one or zero. "Or" gates, indicating that either input is sufficient to give the specified output, were rendered as bullet shapes with concave left sides. "And" gates, indicating that both inputs are required to give the specified output, were rendered as bullet shapes with flat left sides. Signaling outputs that also serve as inputs to downstream events were rendered as open triangles. Branches in the pathway were indicated with filled circles to suggest the resemblance to contact points in electrical circuit diagrams. The HR progresses more slowly in response to avrRpt2 than in response to avrB[4, 25, 26]. Evidence has been presented, however, that differences between HRs are not merely differences in kinetics . As such, the avrRpt2-elicited HR and the avrB-elicited HR were pictured as two separate components. When assayed under standard conditions, ndr1-1 mutant plants did not show the avrRpt2-elicited HR. An "and" gate was used to show that both infection with bacteria carrying avrRpt2 and early accumulation of SA were needed to give the characteristic, "slow HR". By contrast, ndr1-1 mutant plants did show the HR to bacteria carrying avrB. A straight line that is not connected via a gate to SA accumulation thus leads to "Fast HR-associated signals". SAR is gated by an "or" gate with three possible inputs. As DC3000•avrB elicited SAR on the ndr1-1/npr1-2 double mutant, neither of these gene products was essential for SAR induction. The early SA accumulation was not likely to have been essential either, because that was markedly impaired by the ndr1-1 mutation. However, the characteristic avrB-elicited, "fast HR" did occur in the double mutant. 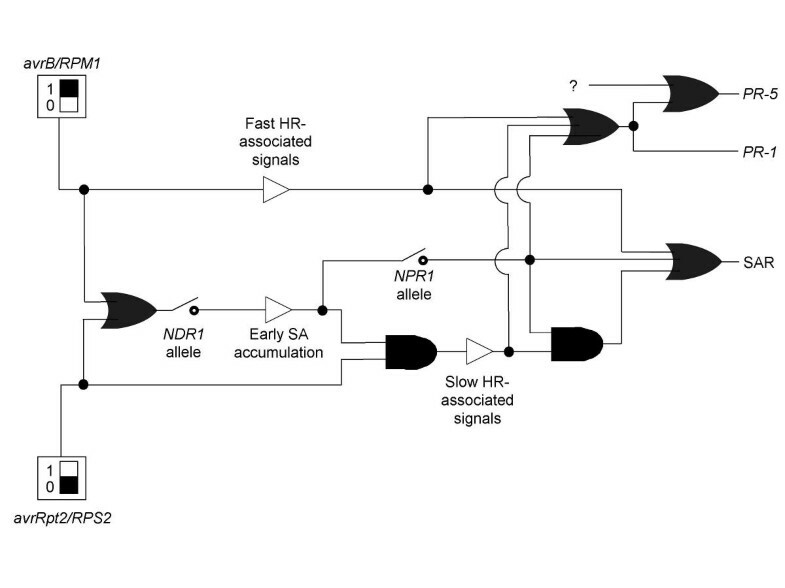 As such, a straight line deriving from "Fast HR-associated signals" is one of the inputs to this "or" gate. Another input is an "and" gate. The evidence requiring this gate is that SAR elicited by DC3000•avrRpt2 was prevented by either a npr1 mutation  or a ndr1 mutation . We conclude that the characteristic avrRpt2-elicited "slow HR" can only contribute to SAR in combination with NPR1-dependent, early SA-elicited signaling, necessitating the "and" gate. The final input is SA-elicited, NPR1-dependent signaling acting alone . PR-1 induction is also gated by an "or" gate with three alternative inputs. The "Fast HR" alone (this study), the "slow HR" alone , or SA-elicited, NPR1-dependent signaling [9–11] were each sufficient by themselves to give PR-1 induction. Induction of PR-5 gene expression can also be via any of these three inputs acting independently. However, we (this study) and others [19, 20] have presented evidence that other pathways can also contribute to PR-5 induction. As such, PR-5 is gated by an "or" gate. One input is a branch point from the "or" gate leading to PR-1 induction. The second input is pictured as a question mark. Evidence has been presented herein that this second input represents at least two pathways. However, the details of these pathways are not known and are thus not pictured. No attempt has been made to represent the kinetics of signaling events in Figure 4. Boolean formalism can incorporate kinetic information through use of gating delays. Differential equations-based kinetic modeling is an alternative means of capturing the rich dynamics of signaling networks [28, 29]. As time-resolved data sets become available and feedback loops are delineated, it may be necessary to use these methods to understand system dynamics and control . However, the authors agree with Genoud et. al. (2001) that the scheme used in that work and in Figure 4 of this paper has advantages for representing the topology of signaling networks. This formalism allows clear differentiation of additive from obligatorily synergistic signaling interactions through use of "or" and "and" gates, respectively. In conclusion, the additive effects of two pathways explain most if not all induction of SAR and PR-1 gene expression by the avirulent bacteria examined. One of these pathways stems from signals associated with hypersensitive cell death and is NPR1-independent. The other pathway stems from SA accumulation and signals through NPR1. By contrast, PR-5 induction by avirulent bacteria involves at least two additional pathways that also act in an additive fashion. Pseudomonas syringae was cultured according to published methods . Arabidopsis was grown in a HTPC walk-in chamber (Conviron, Winnipeg, MN) or a MTR-30 reach-in chamber (Conviron, Winnipeg, MN) as previously described . Columbia, ndr1-1 and ndr1-1/gl-1 seed used were previously described [4, 5]. Seeds of npr1-2 and sid2-1 mutants were generously provided by Dr. Jane Glazebrook (Torrey Mesa Research Institute) and Dr. Christiane Nawrath (University of Fribourg), respectively. The ndr1-1/npr1-2 double mutant was generated using pollen from a npr1-2 plant to fertilize flowers of a ndr1-1/gl-1 plant. The success of the cross was validated by the hairy (non-glabrous) phenotype of leaves of the F1 plant. DNA was prepared from leaves of 5-week old F2 progeny from this cross for npr1-2 detection or cultured roots grown from F3 seeds for ndr1-1 detection. The ndr1-1 deletion was detected by Southern blotting done essentially as previously described . To make a radiolabeled probe, part of the NDR1 locus was amplified using ndr1-1 genomic DNA as template. The primers used in the amplification were as follows: 5'-TCCTAAGGTTTCGTTTTGGGTC-3' and 5'-GGGACGGTTTCAATTCTGTGATAG-3'. The resulting PCR product was gel purified. This PCR product was subsequently used as template DNA in a labeling reaction using the Radprime DNA labeling system (Invitrogen, Carlsbad, CA). The npr1-2 point mutation  was detected using a CAPS (cleaved co-dominant amplified polymorphic sequence) marker . The primers used in PCR were as follows: 5'-CCTGATGTATCTGCTCT-3' and 5'-GCTTAATGCAGATGGTG-3'. The amplified products were cut with FspI to yield a 330 bp fragment and a 134 bp fragment if wild type (NPR1) DNA was used as the template. FspI does not cut DNA amplified from npr1-2 mutant plants. SAR experiments were performed as previously described  except that hand inoculation using a syringe was used instead of vacuum infiltration to introduce the challenge pathogen. Triplicate samples of four leaf disks each were used on Day 0, and quintuplicate samples were used on Days 2 and 4. Error bars represent standard deviations of data means. Significance of differences between means at a given time point were determined using Student's t tests. Values of P were read from a t table. A replicate experiment gave comparable results. In accordance with established practice in the field , data was not combined between the two replicate experiments. Plant growth and inoculations were as described for SAR experiments. Leaf tissue samples were collected at indicated time points. Samples were flash frozen in liquid nitrogen and total RNA was isolated according to Nawrath and Métraux . RNA concentration was determined spectrophotometrically. 25 μg of total RNA was used per lane. Gene specific probes were made from gel-purified DNA fragments using the Radprime DNA labeling system (Invitrogen, Carlsbad, CA). The template DNA used for making probes to detect expression of PR-1, PR-5 and ROC1 (cyclophilin, used to normalize for RNA loading) were PR-1 and PR-5 cDNAs  and an EcoRI fragment of pCG22 , respectively. AGI numbers corresponding to the genes used as probes are AT2G19990, AT1G75040 and AT4G38740, respectively. Northern Blots were performed using standard procedures . Quantitation used a Storm PhosphorImager (Amersham Biosciences, Sunnyvale, CA). We thank Dr. Jane Glazebrook (Torrey Mesa Research Institute) for seeds of npr1-2, Dr. Christiane Nawrath (University of Fribourg) for seeds of sid2-1, Dr. Charles Gasser (University of California, Davis) for pCG22, Dr. John Ryals (Paradigm Genetics) for the PR-1 and PR-5 cDNAs, Dr. Hui Cao and Dr. Xinnian Dong (Duke University) for developing and suggesting the CAPS marker used to detect the npr1-2 allele and Vikas Agrawal (University of Delaware) for suggestions on the Boolean model of signaling. CZ was supported in part by a predoctoral research assistantship from the College of Agriculture and Natural Resources, University of Delaware. This is paper no. 1725 in the Journal Series of the Delaware Agricultural Experiment Station. CZ isolated the ndr1-1/npr1-2 line used, established homogeneity of both mutations, carried out the PR gene expression studies, and contributed to preparation of the manuscript. AS conceived of the study, performed the genetic cross to make the ndr1-1/npr1-2 line, carried out the SAR experiments, developed the Boolean model of the signaling pathway, and contributed to preparation of the manuscript. Both authors read and approved the final manuscript.